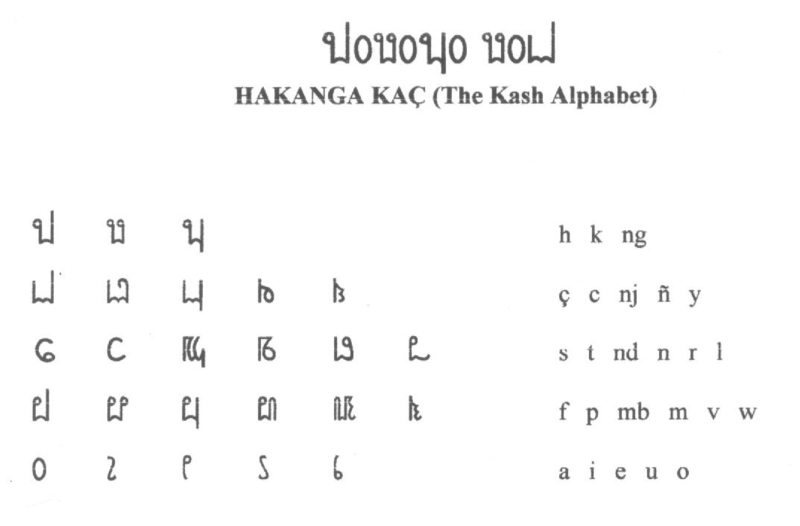 The alphabet is recited: ha, ka, anga, ça, ca, anja, ña... etc. The vowels are called ani, ini, eni, uni, oni. Kash is written left-to-right. There is no upper/lower case distinction; proper names are sometimes printed in a sloping "italic" type-face. Other fonts, often quite ornate, exist for use in billboards, neon signs, advertisements, etc., but they need not concern us here. "e yangandra i e lero"
mesa leroni e yangandra i e lero ileka-mandekasa lire kare çakani laraka. titanju yuka-yukar yarata kaceva re yalipembet payowi. e yangandra e lero içukono re ne ipilimen peçaka lavi ine re ne yaporumek are kaceva yaravas payoni. ende e yangandra yakasisa yamiri çarek krat çarekni, omo lavi mirini lavi yalipembet payowini kaceva ya. lulusni e yangandra yarindi yamiri. tiyanju e lero yakasisa yahunjañ yarukuça fasañi, i tikuluñ kaceva yaravas payoni. ende e yangandra yacayisa yaçun re yacaraka çakani lerowi. One day the North Wind and the Sun were arguing about who had the greater power. Just then, it happened, a traveler came along, wrapped in a cloak. The North Wind and the Sun agreed to consider him the more powerful, who could make the traveler remove his cloak. So the North Wind began to blow as hard as he could, but the harder he blew, the more tightly the traveler wrapped his cloak. Finally he stopped blowing. Then the Sun began to shine, he ignited his heat, and right away the traveler took off his cloak. And so the North Wind had to admit that the power of the Sun was greatest. (Tambranipa is a mythical island-- lush, tropical, mountainous, rather like Bali without the tourists.) 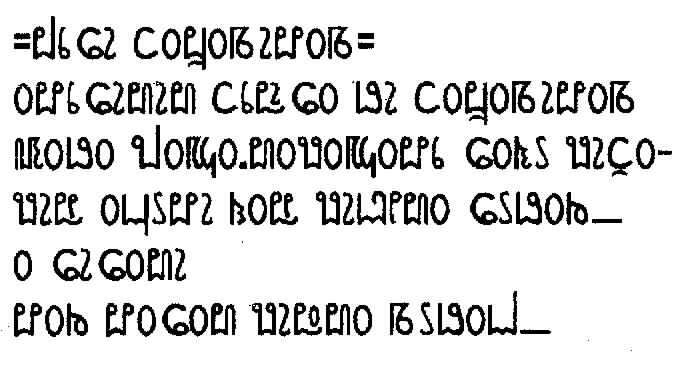 The poem is in a traditional form called "sisami"-- four 12-syllable lines, the last always beginning "a sisami"; rhyme (if present) is by assonance. Sometimes improvised with humor or sarcasm (and much rule-breaking) when friends gather for an evening of wine and conversation. "Sailing to Tambranipa", however, occupies a place in Kash hearts comparable to "Auld Lang Syne" in ours-- it is said or sung at farewells when good friends part and do not know if they will meet again.